The third PES 2015 Live Update, covering the week from November 24 to 30 was released this morning. The PES 2015 December 4 Live Update increases the overall ratings for 17 PES 2015 players, including Wayne Rooney and Robin van Persie, while no players were downrated this week. Konami also a number of youth players and mid-season transfers in the newest PES 2015 Live Update (04/12/2014), including the likes of Chris Eagles (Blackpool), Cristian Ceballos (Tottenham) and Lewis Baker (Chelsea). A total of 17 PES 2015 players were uprated in this week's update, with no overall downgrades in the PES 2015 Live Update (December 4). No less than three Manchester United playes received upgrades based on the 3-0 win against Hull City last weekend. 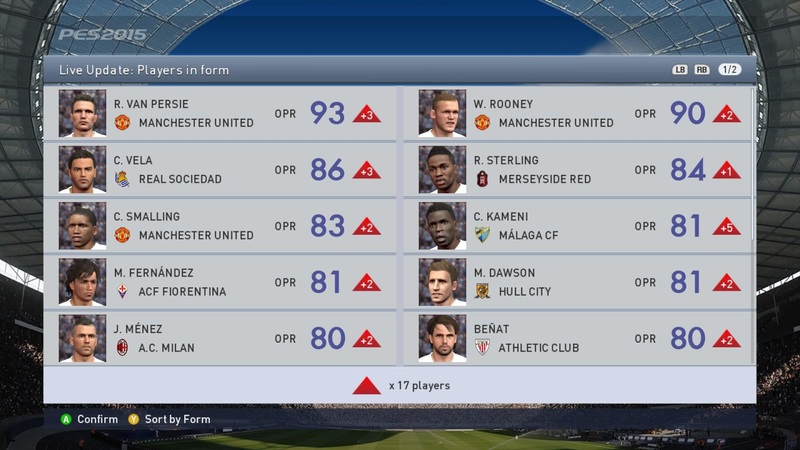 Robin van Persie, who scored and assisted one each in the match, is now rated 93 overall (from 90), while his team mates Wayne Rooney and Chris Smalling also were uprated by two points each, to 90 and 83, respectively. Málaga goalkeeper Carlos Kameni was also given a reasonable boost following his stellar performance in the 1-2 defeat against Real Madrid during which he made seven saves, including spectacular close-range stops against Cristiano Ronaldo. In detail, Kameni's goalkeeping and saving attributes were upped by 5 each to 90 and 83, making him one of the best keepers in Pro Evolution Soccer 2015, at least for a week. Carlos Vela is another player to be given a boost after he scored all three goals in the win over Elche on November 28, he's now rated at 86, making him the fourth best PES 2015 Right Wing Forward, after Bale, Robben and Callejón.